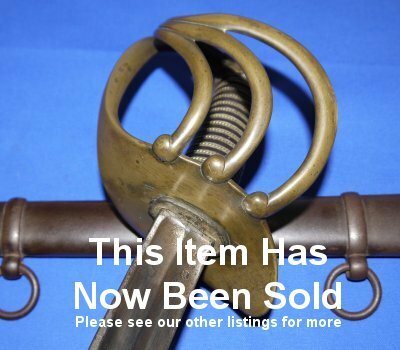 In good to very good condition, guaranteed authentic, a scarce An XI/XIII Napoleonic French heavy cavalry trooper's (cuirassier's) sword, Klingenthal made, dated January 1813. 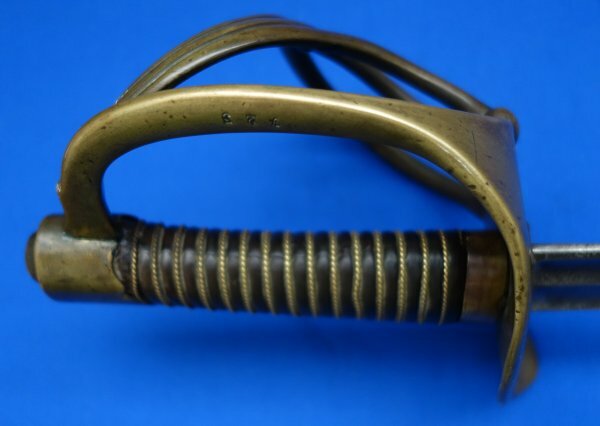 A very good example of this iconic French heavy cavalry sword, which has no post-1815 markings that we can see, and has only one weapon number (723) to the hilt (normally these are struck out and renumbered when kept in service), so it is likely to have come out of French service in 1815 (Waterloo battle trophy). 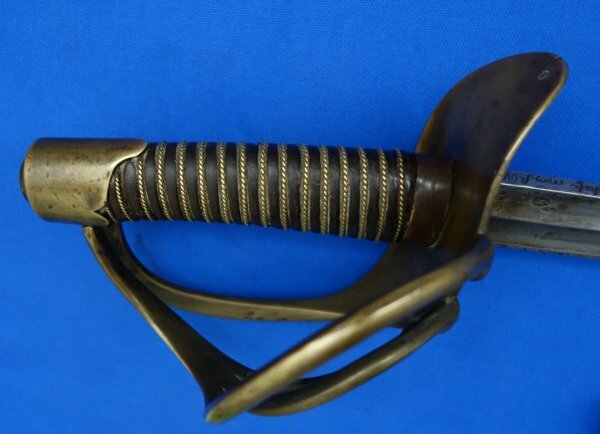 This sword is guaranteed to be 100% authentic, no a reproduction / composite. The date inscription on the spine (January 1813) matches the poinçons on the forte as it should (reproductions do not get this right). The 95.8 cm spear point blade is in overall good condition; there are some oxidation / tarnish patches (looks a bit like electro-plating, but it is not); there is a slight amount of bending towards the point (very slight and quite likely period). 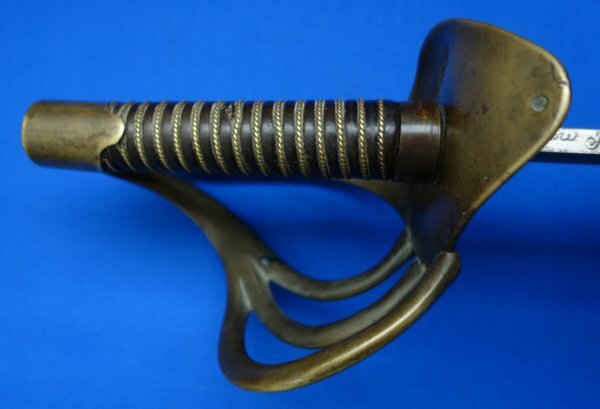 The blade is firm in the grip, the brass hilt generally very good (would clean up bright brass but we believe it looks best as is). Leather grip in good condition. Twisted grip wire bindings good but slightly loose against the grip leather in the middle, probably just leather shrinkage. 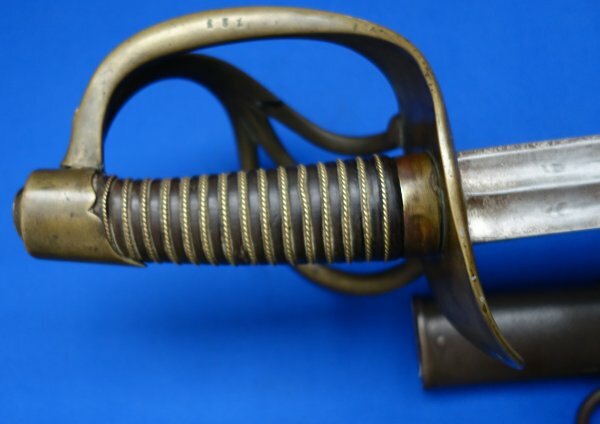 The browned steel scabbard (these scabbards were chemically browned by the French) is in very good shape; the browning some losses towards the chape / drag. The sword sheathes and draws well but can be fussy when you first put the tip in (requires grease; we no longer do this since a customer complained our greased smelled odd). A very good example. On sale for £(too late). Please quote item reference number N61 (1318/9). Further / full sized pictures available upon request.